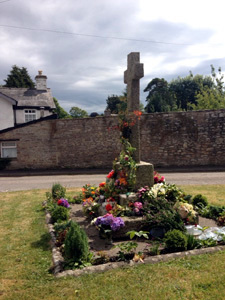 The Glasbury Memorial is the only local outdoor monument to the Fallen of both World Wars. However , Barbara Lloyd has researched the Great War at a comprehensive level using official World War One records, numerous archived newspapers, local churches for commemoration tablets and stained glass windows and also local people and officials from relevant departments. This along with scouring the web has resulted in an in-depth article on the Fallen in W.W.1 and also portrays an insight to the life and times of the early 20th century.